The Burg is one of the most pet-friendly cities in the country. Part of loving your pet is making sure you’re prepared to protect them regardless of the circumstance. With Hurricane Season beginning on June 1, we thought it pertinent to go over some basic safety tips to ensure your family, four-legged and feathered members included, are ready in the event a big storm rolls through. First and foremost, you need to know your evacuation zone. Pinellas County has also curated a detailed emergency guide for all types of weather and warnings that you can view on their website. The city just launched a new mobile alert system for residents, too. You can signup for the service by clicking here. 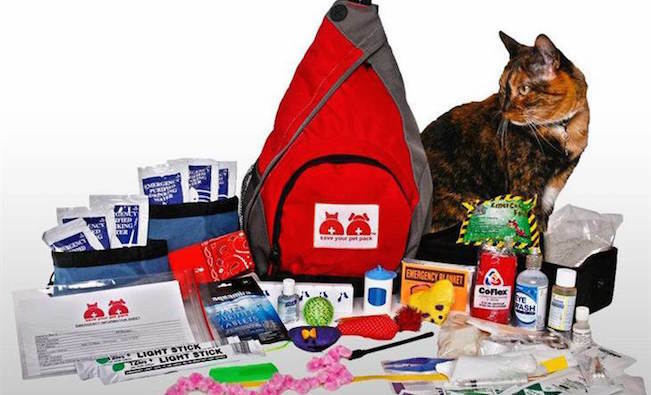 A pet disaster kit is vital if your family needs to be evacuated. The kit should include food and water for at least five days. Make sure to have a manual can opener, as well, and an extra gallon of water in case your pet is exposed to any hazardous chemicals and needs to be rinsed. Make sure all medical records and necessary medications are on hand in a waterproof bag/container. It is also wise to carry an excess of garbage bags to clean up after your pet. For cats, have litter, a litter box, and scooper with you. Harnesses and sturdy leashes are vital, as well as proper carrying crates to transport your pets in. Due to the fact that your pet may be in a crate for hours at a time, it’s best make sure the crate is outfitted with a comfortable blanket and plenty of toys. Ensure that your pet’s identification is up to date on their collar and list out feeding schedules and proper care instructions in case they need to be boarded or placed in foster care. Let rescue workers know that you have animals with a pet alert sticker. The sticker should include the number and types of pets in your home and the number of your veterinarian. You should also have a safe haven planned for your pet well in advance. Your local veterinarian should have a handy list of preferred facilities for you to browse through. It’s also helpful to identify hotels/motels outside of your city that are accepting of pets. It’s always best to prepare for the worst. Technological innovations have allowed for the quick and efficient return of lost pets to their loving home. Microchipping your pet is paramount to their overall security — and Its benefits can be seen beyond hurricane season. The Humane Society estimates that nearly 10 million cats and dogs are lost each year. Only 22% of dogs and less than 2% of cats that wind up in shelters are reunited with their family. A pet microchip and enrolling in a pet recovery database are easy and affordable steps to making sure you never have to worry — 96% of pets with a microchip are returned to their families. For details about microchipping your pet, call Bayshore Animal Hospital and Avian Services: (727) 381-3900. You can also schedule an appointment with Bayshore online. Follow them on Facebook and Instagram for updates on services and specials. St. Pete could become one of the most pet-friendly cities in the country.